Pulse Solutions has worked with Azure for over 5 years. We believe this leading digital-transformation enabler, currently being touted as the best cloud service for Microsoft driven services, is more than capable of meeting the needs of customers who have a Microsoft centric vision. Reliable backup storage, disaster recovery and redundancy, secure data access, scalability and high availability, along with outsourced infrastructure management helps keep expenses low and meets stretched capacity limits. However, having said this, we’d like to caution you about some hidden or not easily recognizable Azure migration pitfalls that lie athwart the path of a successful Azure migration. We’ve picked them up in the course of our experience of working in the area. So, if you’re looking at making the big shift, these tips should help you hit all the high notes. Going all out to reap the vast cloud benefits for all of your workloads or inclined towards a phased approach? Either case, you definitely need a strong migration strategy and execution plan. The plan should begin with a strong business case for convincing finance, a seamless migration plan for getting operations and support teams onto your side, and well-planned contingency tactics for governance, risk, and compliance teams, all of whom have customer safety and security issues as priority. Don’t be eager to start with the migration unless you have the crucial issues sorted out such as specific expected business and IT benefits, documented performance and availability need, detailed security and privacy necessities, a strong understanding of architectural changes and so forth. Let the plan resound with your company’s people, processes, and existing technology and talk about the kind of quality service they can come to expect with Microsoft Azure. Whoever is managing your migration must understand that applications hosted on the cloud and traditional local deployments are dissimilar. Concepts vary, some of them like chalk and cheese. Take for example, when one is developing for the cloud, capacity planning, and resource management will have to be theorized differently. 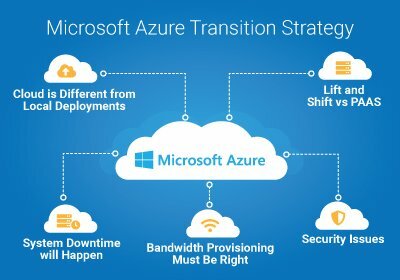 Only if this paradigm shift is understood – that Azure has unique attributes – will you be on the right path when developing for the cloud. Often, those who migrate to the Azure platform fail to take into account how much bandwidth provisioning is needed. Now, what if you are going in for a hybrid cloud solution, and there is a lot of traffic exchange between locally hosted systems and remote cloud elements? And traffic which previously ran over high-speed, low-latency LAN will now take the WAN route? It’s obvious you cannot go with the same local bandwidth for it will choke your efforts. Get in an architecture specialist with Azure migration experience to assess the cost-benefit impact of these bandwidth changes. This one is a no-brainer, but it is often overlooked or stubbornly negated. During migration, there will be periods when a system will fail to perform its primary function. So you need to carefully estimate how much downtime each step of migration will involve, and plan the migration for minimal impact on your business activities. A direct move from physical computers or virtual machines to cloud-based virtual machines offers almost no real benefits, this could potentially end up costing more than physical computers or hosted computers. The real benefit of the Azure platform is the use of the platform as a service tools like web apps, hosted SQL, Cosmos, Azure storage and more. Converting your application to run on PAAS offers the greatest cost savings and scalability benefits. Cybercrime is rife. CIOs need to be convinced that moving infrastructure and software outside to a cloud platform won’t jeopardize their data security. Using secure protocols at the application level is good enough depending on the specific use case. For high-end security implementing a virtual private network with end-to-end encryption will help combat security issues. Following the above-listed tips will make the transition smoother. And when you get rid of your complex apps and vast data storage onsite allowing Microsoft Azure to do the the hard work, you’ll find some amazing business and technical cloud benefits.